Cats and dogs both make great pets but they also make very persistent messes, especially stains that leave strong odors. Normal carpet cleaners and odor removers won’t solve the problem, barely masking the smell of some stains like those from cat urine. Equalizer, however, is scientifically formulated to handle the unique, persistent smell of animal messes, removing both the odor and the lingering territorial smell that brings animals back to the same place. By removing the location smell completely, your pet won’t think about making a mess again in that location, which can save your floor as well as your home. Equalizer can take on stains and smells from animal urine, vomit, feces, blood, old food, and more. For anything that is organic-based, this cleaner will do the job. 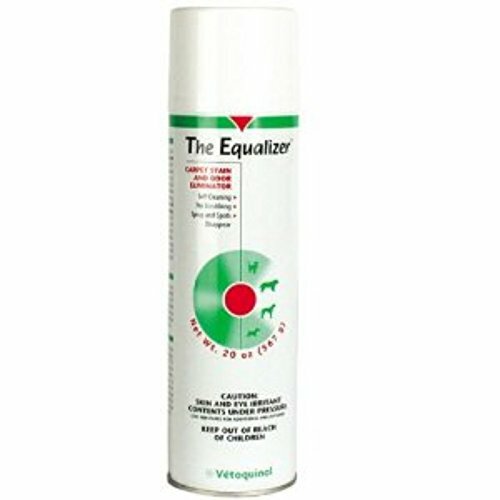 Equalizer was originally formulated for veterinarian clinics to remove stains and smells in the examining room. Today, you can use the same tool to keep your house clean and your pet out of the proverbial “dog house” for leaving a mess behind. Entirelypets.com stocks the Equalizer Carpet Stain and Odor Eliminator, which comes in an easily usable 20oz spray size for compact storage and quick application. Reclaim your home and knock out the odors with Equalizer!. There's no equal to this stain remover. Equalizer Carpet Stain & Odor Eliminator removes organic stains & odors associated with pets, such as urine, feces, vomit & blood. Simply spray the stain, and it will be gone in seconds. Use on carpets, floor, furniture, clothing, auto interiors and more. Great for stains associated with training, debilitated or sick animals, cat litter aversion or elimination behavior problems. Contains no phosphates or CFCs. Do not use on wood surfaces or berber carpeting. Cats and dogs both make great pets but they also make very persistent messes, especially stains that leave strong odors. Normal carpet cleaners and odor removers won't solve the problem, barely masking the smell of some stains like those from cat urine.Equalizer, however, is scientifically formulated to handle the unique, persistent smell of animal messes, removing both the odor and the lingering territorial smell that brings animals back to the same place. By removing the location smell completely, your pet won't think about making a mess again in that location, which can save your floor as well as your home. Equalizer can take on stains and smells from animal urine, vomit, feces, blood, old food, and more. For anything that is organic-based, this cleaner will do the job. Equalizer was originally formulated for veterinarian clinics to remove stains and smells in the examining room. Today, you can use the same tool to keep your house clean and your pet out of the proverbial "dog house" for leaving a mess behind. Removes stains and odors caused by feces, urine, vomit, and blood Also effective against ink, grease, oil, coffee, tea, soft drinks, ketchup, mud and dirt. Copyright © Wholesalion.com 2019 - The Best Prices On Equalizer Carpet Stain Online.